Whereas some people can survive the dirt and the sweat for the few days outdoors, not all people can do it. If you are one of those who can't (and I think you should be), you will agree with me that an outdoor camping shower is indispensable. Here's a list of the best portable showers you can tag along your camping trips to make them more memorable. 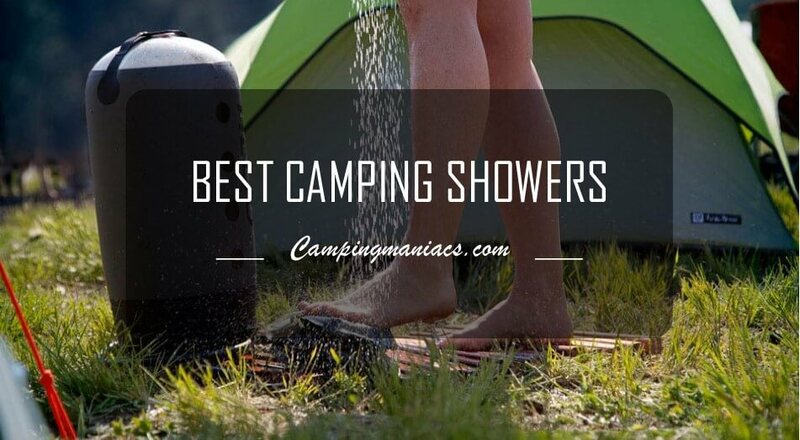 Which are the best portable camping showers? Equipped with a built-in 4800 mAh rechargeable battery, the Iron Hammer is a perfect handheld shower for those who like an enhanced car camping experience. It proffers the most desirable washing pressure due to its selection intelligence which allows you to select between its two water pressure options. The lower pressure is perfect for showering and the higher one best for washing your pet or even your car. If anything, Iron hammer is one of the most versatile camping showers. Although generally built as a portable handheld shower, the subtle design of Iron Hammer is a unique one. Its materials have been carefully selected in a way that allows it to be lightweight but compact at the same time. Its many internal layers are craftily laid out in a scientific way to enable its in-built water filter to function in the most effective way. Quite frankly, the Iron Hammer has a design that is easily indisputable, hence its higher ratings than most other comparable portable showers. The long hose incorporated into the Iron Hammer shower enables it to be extended for a reasonable distance. With 180cm long hose, it is one of those showers you can comfortably hold above your head without feeling like you are lifting the pump out of your water bucket. One thing worth noting about the Iron Hammer is that it can be used with water of different temperatures, whether cold or warm. This makes it a perfect choice for either winter or summer camping. Perfect temperature ratings for it are between 5 and 50 Degrees Celsius. The 4800 mAh battery is a stable one and will see you have your desirable length of shower. The only likely situation is that you will run out of water before running out of charge if you use about 7 gallons of water to shower. With a pumping rate of about one gallon of water per minute, the submergible pump will give you about 7 minutes of shower without depleting the battery’s charge. With the low-pressure selection, the pump takes about 2 hours for the charge to be depleted. The higher pressure selection takes about half this duration before depleting the charge. We didn’t like the fact that the cover for the electrical recharge port looked a bit flimsy and likely to let in some droplets of water. You could blame my paranoia but every time I use it, I have to reinforce it with a tape to make sure that it is completely water-tight. We do hope that Iron Hammer will consider replacing the cover with a better one in their future designs. Another feature that wasn’t quite impressive is the location of the on-off switch for the pump. Situated right on top of the submergible pump, the switch isn’t one of the easiest to reach out for when showering. Thus, instead of trying to turn the pump off while soaping up or scrubbing, our team found it wise to just let the handheld shower head drain back into the bucket. We hope to see a modification that allows the switch to be somewhere closer to the handle of the shower head in future designs. Has a stable design that is also unique and incorporated with an in-built water filter. Suitable for use with a wide range of water temperatures hence suitable for both summer and winter showering. Its battery is large enough and stable to allow uninterrupted showers of your desired duration. It proffers water at different pressures which makes it versatile and useful for a number of purposes. Cover for the recharge port has a flimsy design that is likely to leak in some water. The location of the on and off switch for the pump is not appropriately located. If you are looking for a sturdy, versatile camping shower that can be used to wash both you and your pet, the Iron Hammer is the perfect choice for you. Its performance is way above that of many other portable showers in the market today. The Ivation portable outdoor shower is a simple, easy-to-use and attractive outdoor shower for campers, hikers and backpackers. It is lightweight, stylish and designed to give you enjoyable showers after a long day in the wilderness. It proffers a gentle and consistent stream that is neither too low nor too high in pressure hence a preference for many shoppers. Since this system does not come with a container or reservoir, it is ideal for clients who do not have a lot of storage space in their backpacks or bags. Moreover, this stylish portable outdoor shower is very light hence easy to carry around. The Ivation portable outdoor shower works on a 2200 mAh rechargeable battery. The battery powers a basic water pump to provide a consistent shower stream for your bathing needs. Most people are usually skeptical about buying battery-powered outdoor showers due to their charging mechanisms and the convenience of that when away from home. This should not be a problem here as the portable charger is so easy to charge and will run for well over 45 minutes with a single charge. Moreover, you can charge it using a USB cable in your car, laptop or power bank. Basically, this system is a simple head, pump and hose combo. It can therefore be used by simply immersing the water pump in a bucket, river or lake and hanging/holding the shower head above your head to enjoy the steady stream. The system also comes with additional accessories to make your experience home-like. For example, it incorporates a built-in filtration system that ensures you have clean water from whatever source. The system is lightweight and highly portable. Recharges using a USB hence can be charged away from home in a car or a computer device. Offers a consistent and steady flow of water. Does not have a water heater. You cannot go wrong with the Ivation portable outdoor shower. This portable handheld shower is easy to use and convenient for quick fix cool showers especially in hot environments. This versatile system can also be used to wash pets hence a favorite for pet owners and camping enthusiasts alike. It scores highly in a number of key considerations hence one of the top picks in this list of the best portable camping showers review. The Suaoki Outdoor Powered Handheld Portable Camping Shower is a super product for campers. Powered by a standard cigarette lighter plug, the Suaoki portable shower is the best portable shower for car camping. This lightweight camping shower is versatile and a sure way to get a clean wash in the wilderness. Portability is a key factor to consider when shopping for any camping or hiking gear. By and large, this depends on the weight and compactness. The whole system weighs less than a pound hence scores highly when it comes to being lightweight. Moreover, since the system consists of a water pump on one end and a shower head on the other, it is very compact as the additional accessories do not add any considerable weight to the system. This is a camping shower that you will easily carry along whenever there is need. It is also easy to store and maintain. The world has come to a point where no one wants to buy a product just for a single function. In any case, not so many people would afford the time and expenses to go camping weekly or even monthly. So why would you buy a water shower that you will only use twice or thrice a year? It only makes sense when you can make it useful in other areas. Well, the Suaoki portable shower has a long power cord, an S-hook and a suction cap to increase its versatility. It can therefore be used for washing pets, cleaning cars, watering plants and many other home tasks. More versatile than most camping showers. Compact and lightweight hence very portable and easy to store. It has a water filter system incorporated. The spray is not as big a your ordinary bathroom shower spray. The handle looks weak and may be susceptible to breaking. Does not come with a reservoir or water container. Lately, camping showers without reservoirs or water containers have become absolutely trendy and popular. The Suaoki Handheld Portable Camping Shower is one of the best such showers in the market. It is quick, convenient and operates on just a single on and off switch. In addition, this system is compact, portable, and fairly priced. If you are looking for something to make your backpacking, camping and hiking more comfortable then this shower has a solution for you. The ZODI Outback Gear Hot Tap Shower is your ideal camping shower for cold environments wherever you go. It perfectly brings together quality, performance, durability and versatility. While this impressive product may seem slightly more bulky than most other portable showers without water containers or reservoirs, it comes with an 8 foot house to aid with convenient movement when there is need. It is therefore best for adventurers traveling in an automobile. 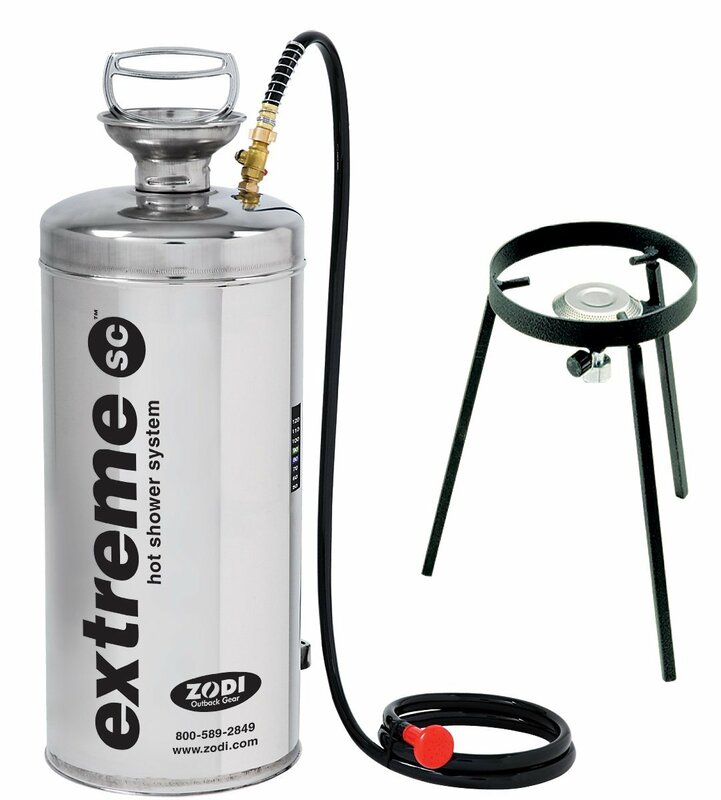 The spectacular ZODI Outback Gear Hot Tap Shower is run by 6 volt water pump which is incredibly powerful and provides fast and consistent water flow. This system gives you the pleasure and convenience of creating your water station anytime. As an instant hot water shower, you do not need to wait to get your hot water. The self-contained water shower delivers hot water in just a few seconds. The shower comes with everything you need. You are therefore saved from the hassle of tagging along a bucket or forced to take showers at the water source. Many people buy expensive water showers but end up not using them because they are either too difficult to operate or come with instructions that are not easy to follow. They therefore leave them to gather thick layers of dust in stores or shelves. Well, there is certainly zero chance that you will end up with this scenario if you choose to buy ZODI Outback Gear Hot Tap Shower. Operating the system using the push button ignition is a breeze. Again, to get a comfortable shower, simply fill the 4 gallon water container and let it heat over the stove. Well, this is not too difficult to muster! Versatile as the stove heater can also be used for cooking. Comes with a storage case for easy transportation. Can easily attach to a 16.4 ounce or 5 gallon propane tank. You will need D-cell batteries to power the system. The ZODI Outback Gear Hot Tap Travel Shower is a splendid product for camping, hunting, hiking and backpacking. It is specifically best suited for family members or a group of friends who want to enjoy comfortable home-like showers even when away from home. It is fast, convenient and versatile. As a matterof fact, this is a product you will find so useful and worth every single cent. Experience unmatchable outdoor showers with the classic Advanced Elements 5 Gallon Summer Solar Shower. It is easy to use, compact and durable. Advanced Elements team has set the bar much higher with this particular camping solar shower as they employ a heating technology that is certainly beyond reproach. The advanced technology and workmanship of this portable shower ensures consistent water flow and long service. It involves a 4 ply construction that has the ability to withstand the harsh outdoor environments. More interestingly, this low-tech gear is all intact and has very minimal moving parts. The 4 layer bag does not produce any frills or bells. These features guarantee you a durable camping solar shower. The world today is all about technology and the Advanced Elements Summer Solar Shower has impressively maximized the use of technology to ensure that the system is efficient and reliable. Firstly, the travel solar shower has a reflector panel that hastens the generation of warm water. You do not have to wait for hours to enjoy a clean bath. Secondly, there is a second insulator panel that ensures that your water does not lose the heat so fast! Finally, the system has a temperature gauge which reliably indicates when your water is ready depending on your preferred choice. Does not need batteries, gasoline or propane to power. Has an additional side pocket for soap, toothbrush and your shampoo. Heats slowly in very cold environments. Needs good care or may leak along the seams if not properly taken care of. You can never go wrong with the 5 Gallon Advanced Elements Summer Solar Shower. This easy-to-use camping shower is a sure, reliable and efficient way of enjoying warm showers when you are out camping, fishing or hunting. This is a product you will find absolutely useful. With just a water bucket, the Produtrend Portable Handheld Shower gives you a memorable camping or hiking experience. This super lightweight and compact outdoor shower kit features a basic shower head and a standard battery-powered water pump at either ends of a fairly long hose. Since it is a super lightweight and compact product, this handheld shower will not take a lot of your much needed space. It is therefore an ideal camping shower for hikers who do not have a lot of space but would still want to enjoy the comfort and convenience of a portable shower when on the go. The Produtrend Portable Handheld Shower is one hell of an amazing gift item. Its compact design will impress a friend or relative who is an outdoor adventurer. It is therefore a good birthday, Christmas or Valentine's Day gift to people who love having fun up the mountains, beach, and music festivals or on the road. Moreover, this handheld portable shower is ideal for cleaning pets and washing cars among other outdoor adventures. Unlike most solar powered outdoor showers which may not work well in freezing temperatures, the Produtrend Portable Handheld Outdoor Shower for Camping is structured for all weather conditions. This is because it is powered by rechargeable batteries which guarantee reliability and consistent use. A single full charge will last you about 60 minutes of non-stop use. Isn't this exciting? Portable and easy to use due to its compact and lightweight build. The package includes a USB charger hence useful in all weather conditions. Does not have a water purifier or filter. Does not have a built-in water heater. The Produtrend Portable Handheld Shower stands out among common handheld camping showers. It is lightweight and compact hence easy to use and move around. More interestingly, this precious gift item is easy to charge as all you need to do is plug the USB charger in your phone or laptop and you are good to enjoy your showers when on the go. Give it to a loved one as a gift and they will have all the reasons to remember you for decades to come. The Kedsum portable outdoor shower is a simple, easy to use and an attractive outdoor device for campers, hikers and backpackers. It is lightweight, stylish and designed to give you enjoyable showers after a long day of outdoor activities. It proffers a gentle and consistent stream that is neither too low nor too high in pressure hence a preference for many shoppers. Most people are usually skeptical about buying battery powered outdoor showers due to their charging mechanisms and the convenience of that when away from home. This should not be a problem here as the portable charger is so easy to charge and will run for well over 45 minutes with a single charge. Moreover, you can charge it using a USB cable in your car, laptop or power bank. Basically, this system is a simple head pump and hose device. It can therefore be used by simply immersing the water pump in a bucket, river or lake and hanging or holding the shower head above your head to enjoy the steady stream. The system also comes with additional accessories to make your experience home-like. For example, it incorporates a built-in filtration system that ensures you have clean water from whatever source. Recharges using USB hence can be charged away from home in a car or computer device. The water flow controls are in the submergible end making it difficult to stop water when you scrub. You can never go wrong with the Kedsum portable outdoor shower. The portable handheld shower is easy to use and convenient for quick fix cool showers especially in hot environments. This versatile system can also be used to wash pets hence a favorite for pet owners and camping enthusiasts alike. 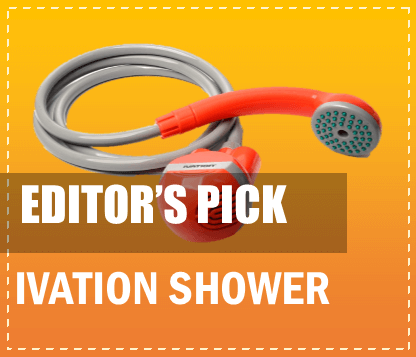 It scores highly on a number of key considerations hence the Editor’s best pick in this list of best portable camping showers review. The Nemo Helio Pressure Shower System features 11-liter water tank, a flexible hose, a spray head and other salient features that make your bathing more comfortable and safe. Without having to struggle, these features make the system the ultimate solution to your outdoor bathing need. It is simple but features a sleek and presentable design that you will feel happy to own. This is a hassle-free portable camping shower. While most camping showers will require you to keep holding the shower head or spray over your head as you take your bath, the Helio has a hanging mechanism hence leaves both your hands free to do the rubbing, scrubbing and rinsing for a super clean bath. It is therefore an ideal shower system for people who would feel too tired to multitask but still need a clean bath or those people who are obsessed about cleanliness. Most people do not feel so confident with electronics. In fact, some people feel scared even with the most basic electrical arrangements like rechargeable batteries, a standard cigarette light charger or basic fuels. This system saves you the fear but still performs incredibly! Apart from the fact that this gear has no complicated machinery or electronic mechanism, the Helio system also has a safety strap just over the fill opening. This ensures that there is no chance that your tank will accidentally open during operation. Since the system does not have complicated electrical mechanism, it is easy to operate. You have the privilege of controlling the pressure using the foot pump as both hands are left free to give you a well-deserved bath after a long day adventure. The long hose also flexes easily and will neither wear out nor kink easily even after long-term use. Can as well be used for washing dishes. Comes with a ventilated carrying case for portability and maximum comfort. Does not have a water heating mechanism. Takes time to refill particularly in shallow water sources. Do you need a camping shower that will leave your hands absolutely free to do the scrubbing and washing just like you do at home? The Nemo Helio Portable Shower is your ideal choice because that is what it provides. Moreover, with just a little muscle and time, use the foot pump to deliver consistent pressure as you enjoy your bath. In many ways, the Nemo Helio Pressure System is certainly the best gear for men and women who love to backpack. The Acetek Handheld Rechargeable Shower means more than your ordinary camping shower. It is super light and easy to use. Moreover, this portable shower settles your worries on the safety of water you are likely going to get when you go camping deep into the wilderness. The Acetek Handheld Rechargeable Shower is an absolute measure of convenience and reliability. First, it comes with an S-hook which effectively enables you to hang the shower head and free your hands for a more detailed bath. Secondly, even though the system uses a rechargeable battery, you will not be compelled to plug the whole system to a power source to charge. Instead, you only need to disassemble the small grip and use a USB port to charge from a car, phone charger or laptop. The 2200mAh lithium rechargeable battery generates enough power to provide consistent flow and admirable shower pressure. When fully charged, the battery lasts about one hour of continuous use which is by far more than enough for a good bath. With this outdoor gear, you do not need to depend on solar or exhaustive foot pump to take your bath. Has a built-in water filter. Does not have a water reservoir hence the need for a container or use at the water source. Does not have a water heating system. Travel anywhere and still experience clean, safe and comfortable baths with the magnificent Acetek Handheld Rechargeable Shower. Irrespective of how clean the water is, the purifier will get rid of all the bugs while the S-hook will conveniently render your hands free for a thorough wash. Finally, just like most portable showers, this system is versatile, portable and powerful. One of the greatest shopping tips for a camping shower is portability. The OUTAD Portable Camping Shower is arguably one of the most portable camping showers on the market today. This is due to its compact and lightweight build. This traveling shower kit weighs well under 1 pound and very compact when not in use. These two features make the OUTAD Portable Camping Shower easy to move around with when camping, hiking or hunting. It is also important to note that the system is easy to store when not in use. The compact nature takes up very little of space that you may only be fantasizing about. The system employs a Hassle-free one touch operation mechanism that is easy to operate. This makes it an ideal camping item that you can use with a bucket, tub, sink, stream or any other source of water. This camping shower has an inline water resistance and consumes very little power. Best for warm temperatures since it does not have a water heater. Get the best out of your hiking, camping and other outdoor events with the versatile OUTAD Portable Camping Shower. This system is favorably priced and has amazing features. It is lightweight, easy to use and highly convenient. In every context, this is one of the best camping showers for the price. The Coleman 5 Gallon PVC Solar Heated Water Camp Shower makes it to the top of our list of best portable solar camping shower kits. It is a simple system that costs a small fraction of what all the kits discussed here cost while still offers amazing comfort and convenience. As a matter of fact, this could be the most affordable camping shower kit out there. It is easy to use and a good starting point for people who are pessimistic about buying a portable shower for outdoor use. With a favorable price, this is also an ideal camping gear for those working on very mean budgets. Just like most solar heating camping showers are gaining popularity day by day, the Coleman 5 Gallon PVC Solar Heated Water Camp Shower has consistently gained popularity among camping enthusiasts here in the United States and in other parts of the world as well. This is mainly because while they are less costly and less demanding, they provide you with warm water just like you would have it in the confines of your home. The system comes with a water reservoir that holds up to 5 gallons of water when full. You will agree with me that this is a great capacity that will accommodate at least a couple of refreshing clean baths. The container also has a strong handle which comes in handy when you need to hang or carry the bag. Finally, the kit gets more convenient with the on and off valve just next to the shower head. Has a big reservoir which allows you to manage your water better. May not heat water in freezing environments. It is not easy to carry the filled bag. The Coleman 5 Gallon PVC Solar Heated Water Camp Shower is a great choice for people who would want to try their hands on a good camping shower. It is affordable but is a lot more durable, convenient and easier to maintain than most other more expensive options. Make your outdoor expeditions more refreshing and fulfilling by investing in this little camping shower. How Do You Choose the Best Portable Shower? No one wants to buy a product that will serve them for a single trip only. Therefore, when shopping for a portable shower, it is ideal to consider the workmanship and the material in its manufacturing as these will determine its lifespan. Even with continuous use, a good camping shower should take you through a number of years. Just like their names suggest, outdoor shower kits are mostly meant to be used outside the home and this means that you will need to transport them along wheneveryou are on the go. Depending on the means of transportation, you need to consider a kit that is both compact and lightweight as these two features determine how portable the system is. Of course not so many people go camping during winter, but this will depend on the environment and the season you intend to go camping. Hot water systems are ideal for colder climates while cold water systems are good enough for warmer and hot environments. Solar, Battery or Pump Systems? All these come with merits and demerits. For example, solar-powered camping showers are cheaper to run but may not work well in areas with no or with very little sunshine. On the other hand, battery powered showers can work well anywhere but you will need a source of power to recharge and of course the batteries. Foot-pump-operated systems do not need any servicing except a little time and muscle as you pump. Systems with water reservoirs have the sole merit of giving you the opportunity to have control over your water. However, you will need time to fill and carry the water to your camping site. For submergible water pumps, all you need is a bucket to dip it in as you enjoy your bath. In fact, you can even bath directly from the stream or a lake. Hose length may not be a priority when you decide to buy a kit with a reservoir that you will need to hang or suspend as you use. However, for other types of kits, you will need a hose that is at least 7 feet long so that it can comfortably go past your entire height.